If the rumors that Sony may be re-releasing a remastered HD bundle of PS2 classics Ico and Shadow of the Colossus are true, it could look something like this. 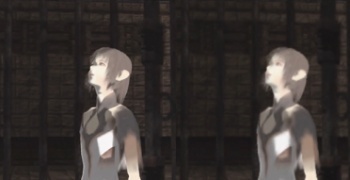 Last week, we heard rumors that Sony could be planning an HD-remastered re-release of Team Ico's last-generation masterpieces for 2011 in an attempt to build hype for the studio's upcoming The Last Guardian. While the story remains a rumor (even if it's one that we really, really, really want to be true), the tech gurus at Eurogamer's Digital Foundry decided to work some high-tech wizardry to approximate what the games could look like in glorious high resolution. Digital Foundry had previously done something similar with God of War in advance of the HD re-release, and came away with results that looked pretty darn close to the actual thing. While the emulation they use still has "some way to go," and a lot of the techie-talk is over my head, all you have to know is that the results make the already gorgeous Ico - and the stunning Shadow of the Colossus - look even gorgeous-er. Also, Colossus looks a lot better when running on hardware that can actually support a consistent 30 FPS instead of the 15-20 FPS it managed on the PS2. Foundry's results also reveal that even the decade-old art in Ico might not need to be replaced with something that doesn't look like crap in HD - the core art "is more than up to the task at hand." Make this happen, Sony. Pretty please?